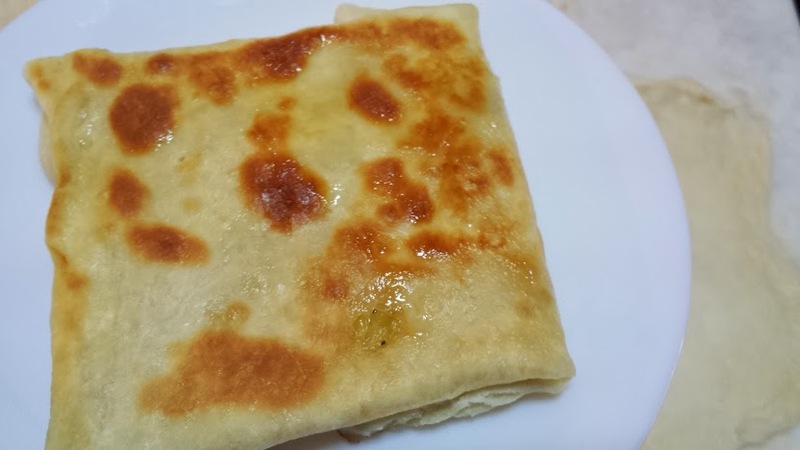 I was in the mood to cook over the weekend and decided to try my hand at making the Thai pancake or crepe. It was sold in the streets of Khao San, where we stayed during out trip. The vendor was the only person selling this, and making a buck per order, which is not bad at all. A quick google led me to Thai Panckae recipe. And checking the list of ingredients, i had everything at home. So off I went. After the initial kneading, I let it rest for 30 minutes and got to work. I put in the non-stick pan with some oil. I put bananas and wrapped the bananas with the excess crepe. After a bit of browning, I flipped and cooked the other side. This turned out a bit bland, so a bit of sugar in the filling was added to the next ttwo crepes. 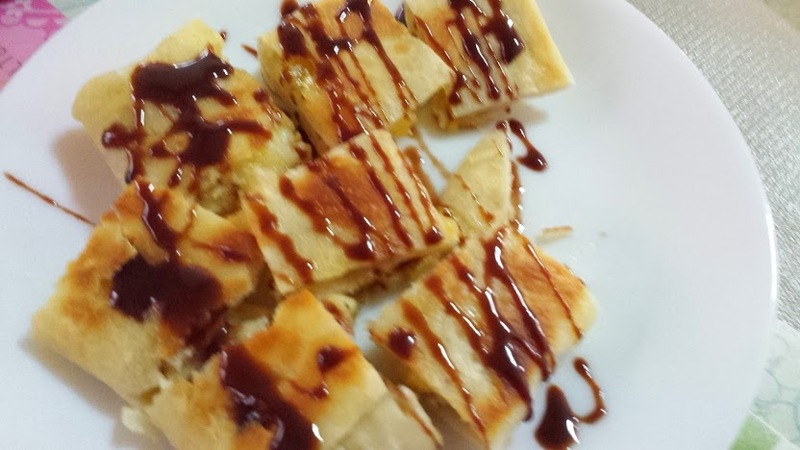 And accidentally burning the crepe was a godsend since this turned out tastier. Watch the videos metioned in the recipe description. Sift the flour into a large bowl, and form a crater in the sifted flour. Pour the water/egg mixture into the flour, and mix well. Add melted butter. Knead this until the bowl is clean and you have a nice ball of dough. Lightly coat the dough ball with vegetable oil (we like canola oil). Let it sit for 30 minutes. Next, knead your dough a bit more, and form it into several balls (dough for 8 small pancakes of 3 to 3 inches). Coat them with vegetable oil. 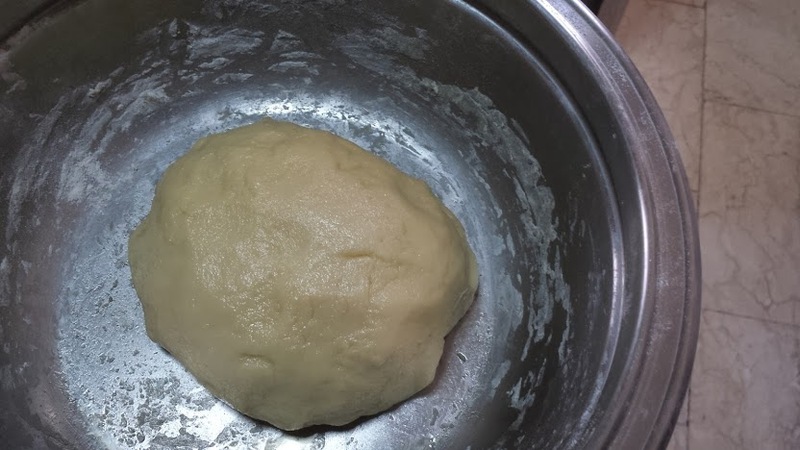 Roll a ball of dough flat with a rolling pin, then cut from center out to edge. Roll it up. Push it in with your finger. Repeat this a few times. Now roll and stretch the dough ball into a very flat square sheet (8 to 8 inches), for this step coat it with a bit more oil, pick it up and place it on a hot (highest setting) pancake griddle that has melted margarine on it. You can use a skillet also, but we found that our electric pancake griddle works great. Note. this step is not easy, you will need some exercice to perform this step perfectly. Add chopped banana or your favorite filling in the middle. Wrap horizontally one side first, then opposite side. Then vertically one end, then opposite to that end and make a purse covering the filling. Flip and fry for another 30 seconds. It took about 1 minute to finish cooking. 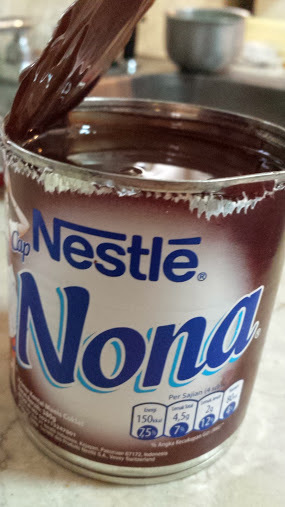 Cut into 9 pieces and if you like top with sugar or with sweetened condensed milk. Enjoy this recipe! It’s a lot of fun, and very tasty. Note: I had cherries at home. I used them for filling using some cornstarch to make the juice thicker.